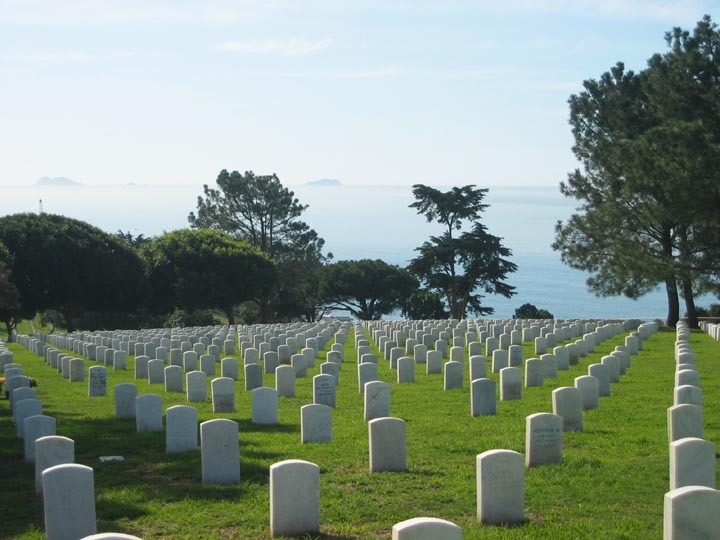 Three of my widow support group have husbands buried at Ft. Rosecrans cemetery. A fourth one has a fiancé buried there also. All of our men are in very close proximity to each other – probably because they all passed away at just about the same time. Three of us try to visit our husbands once a month, if for no other reason than to make sure they are still there. I usually use the time to berate him for leaving me. Sometimes I bring flowers from our garden; sometimes one of the other women bring a sticker to put on the plaques – a forbidden practice but we do it anyway; sometimes we bring individual windmills to stick in the rocks below the walls that hold their remains. Three months ago when three of us went on our monthly trek, we were amazed at how dry the grass looked. It looked like the area had not been watered in weeks. It certainly did not look like a well-kept cemetery honoring our Nation’s military personnel. Sometime in the past few months – since we had been up to see the “dying of the grass” we read that the cemetery is going to replace the grass with artificial turf. Really? Acres and acres of artificial turf? We read that it had already been started in an area not in current use. The feeling was even though it will be terrible expensive, it will save money in the long run because water will not be used, and if pipes break they do not have to be repaired. Two months ago, three of us went back to visit our men because it was one of the widow’s birthdays, and it has been a tradition for us to visit our spouses on special days. The lawn was all torn up and it appeared that new pipes were being installed. We thought that was odd, because if artificial turf is going to be laid who needs new piping? What was more curious, and funny in a macabre way, was that one of the widow’s – in fact the one celebrating her birthday – was standing in front of her husband’s marker when a rotating hose was turned on and drenched her. This was at 1:00 in the afternoon. She quickly got out of the way, but she was soaked. The nasty thought went through my mind that she was going to get in my new car soaking wet. She did, but there was no lasting damage. This Thursday she went back up to Ft. Rosecrans with her brother-in-law to visit her husband’s grave because it was his birthday. The grass looked somewhat better, but believe it or not, she was standing in front of the plaque when the sprinklers were turned on and she was soaked. Again! This time one of the workers came over and with a special tool turned the water off. But the damage was done again. The worker told her that they try to water when there is no one visiting. Well….how interesting. I cannot water when I want to water; I have certain days that I can water; and certain times. I cannot water at 1:00 in the afternoon. In fact, I cannot water at 10:00 in the morning. So doesn’t the government – the Federal Government – have to follow the same rules as everyone else? We keep hearing how we in San Diego are running out of water. Why does Ft. Rosecrans not have to adhere to the same watering schedule as we do? If we follow the premise of the worker, the grass is dry because there are too many visitors to water? Come on! That’s not the truth. Why doesn’t Ft. Rosecrans water in the early morning? Are they truly so special? The worker told my friend that they have been asking for new sprinklers for years. They think they are going to get them soon. So what’s with the artificial turf? Who’s running the show? Or…who’s running the sprinkling system. Seems to me that the City of San Diego, and the homeowners are getting shafted yet again. I guess that what is good for the goose is no longer good for the gander. What a shame. The widows and I went up to Ft. Rosecrans today to visit our husbands. We were shocked to see that all the trees near their burial wall were gone. Uprooted. Patches where they used to be. And the grass was brown. All brown. No shades of green. The cemetery is depressing enough, but seeing it in this condition was heart rendering. What is going on? Honestly, I think it’s just poor management and planning. That grass has been neglected for more than just a short time.